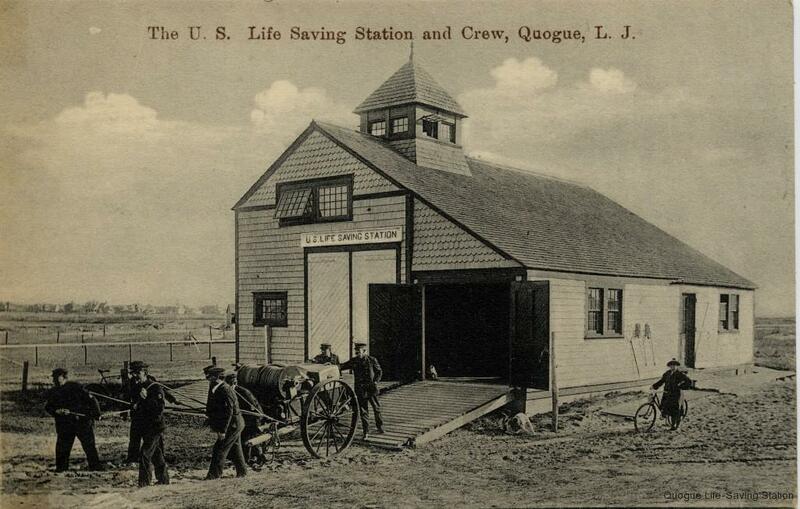 The United States Life Saving Service (USLSS) and its Station(s) in Quogue have played a significant role in the Maritime History of the East End of Long Island, New York. The first Life Saving structure in Quogue, built in 1849, was just a simple garage located behind the dunes and was manned by volunteers. The second structure or “Station” was built in 1872 and was a more substantial building. It housed a more permanent crew and was equipped with sophisticated rescue apparatus, as pictured in the photo above. It also had an observation tower to monitor ship traffic. It was expanded again in 1887. It was moved in 1917 and is now a private home in Quogue. 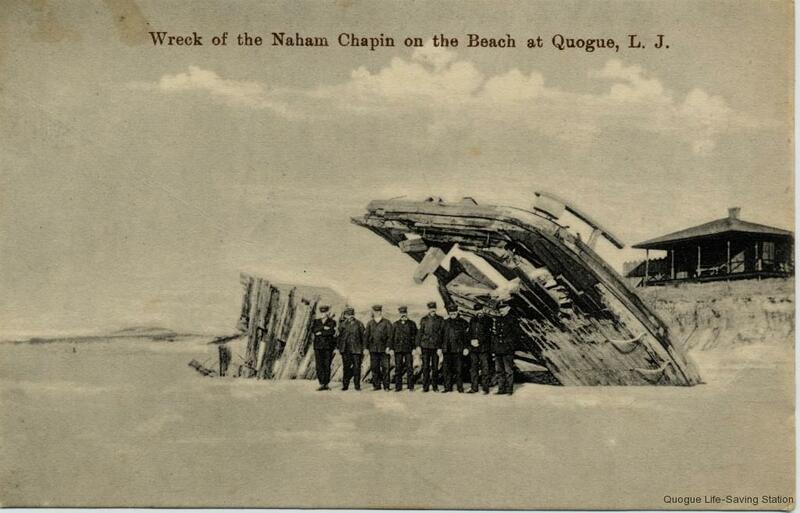 Numerous wrecks and rescues were recorded at the USLSS Quogue Station. Many details of the early wrecks have been lost, but as maritime traffic increased in the later part of the 19th century, more wrecks occurred with more loss of life and property, resulting in spectacular rescues. The most famous wreck off of the Quogue Beach is the Wreck of the Four Masted Schooner “Augustus Hunt” on January 23, 1904. A total of 8 lives were lost. During the rescue, two Quogue Station Surfmen, in risk of “extreme peril” were able to save two of the ships crew. Both surfmen were awarded Gold Life Saving Medals, the highest honor the USLSS could bestow. Please visit our separate page on these Medals. 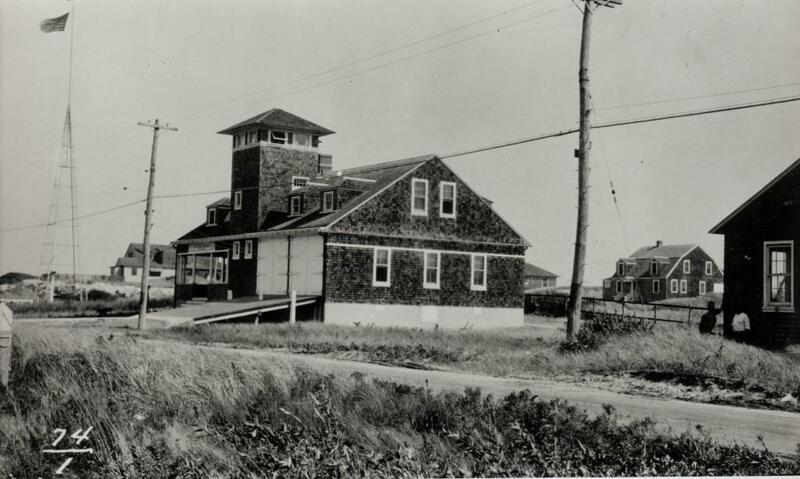 In 1912, the USLSS built a third and final structure in Quogue, as pictured above. Today, this building remains perfectly intact, and is in its original location on Dune Road. Besides spectacular ocean rescues, the exiting property and structure is historically significant in many ways: It was home to Quogue’s first Telephone line (242). There is a USGS Geodetic Survey Monument in the Tower. It had its own radio tower and signal towers that could be seen for miles. It was active during Prohibition in pursuit of Rum Runners. It served the local community during the darkest days of the Great Depression (including festive dances held in the Boat Room). It survived the 1938 Hurricane and famously sheltered survivors in its Lookout during the storm surge. It was fully operational during WWII as a US Coast Guard Station for Beach Patrol operations. For these reasons, it has been listed on the National Register of Historic Places. It is now a private home.